I have been selling folk art in our gallery, CADEAUX du MONDE, since 1987. Invariably when people ask me what I do for a living and I respond that I am one of the owners of a green fair trade international folk art gallery, after an initial quizzical look from the majority of questioners, I hear the inevitable next question "What is folk art?". After 24 years of sourcing and buying folk art directly from the artists who produce it, studying about the various traditions and sharing it with the public in our gallery, I am fairly sure that I know what folk art is and I am also reasonably confident that I can communicate that knowledge to the public. When I was getting ready to write this post, I looked at The American Heritage Dictionary definition listed below. I think that it is basically a good definition with the exception of the last phrase "unschooled artists". While folk artists generally do not attend art school to learn their skills, they are highly skilled artists, artisans and craftspeople and the majority have spent years learning the cultural heritage, traditions and technical skills needed to become accomplished folk artists. As folk art is better appreciated when it is seen, not merely described, I have decided to include several examples of different types of folk art from a variety of areas around the world that illustrate the wide range of different mediums that folk art encompasses. The following examples are a testament to the high level of skill and artistry of folk artists as well as the unique cultures that have produced such treasures. 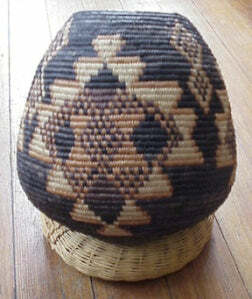 The Zulu Beer Basket pictured below is an example of a typical African folk art tradition--basketweaving. Zulu baskets are an integral part of Zulu custom and decorative beer baskets are made for special events, celebrations and as gifts. Handcrafted using the coiling method of basketweaving, the coiled grass is bound and handstitched with shredded Ilala palm leaf. The different colors of the basket are created from natural dyes using berries, leaves, clay, roots, dung or a combination of these. 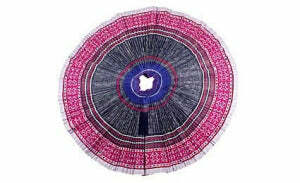 The different designs and patterns on the basket indicate the "lobola"--the bridal price paid in cows to the bride's father. This style of basketweaving is traditionally done by women who pass the craft, techniques and designs along by teaching their daughters and granddaughters. Many folk art traditions are gender specific and are passed from one generation to the next. Oriental rugs have been handwoven for over 2500 years by nomads, in villages and in royal manufactories, and the art is currently practiced in North Africa, Eastern Europe and throughout Asia. Each Oriental rug is unique, integrating patterns brought by traders with traditional ones--daily life can be seen running through the threads. 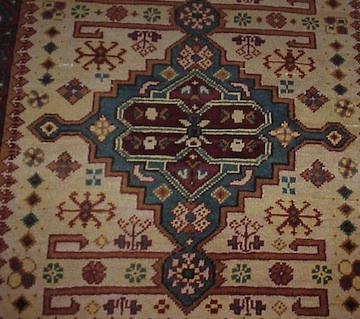 The image below is a detailed view of the center design of a Kazak Afghan Rug that was handknotted using a Sarouk weave which is a ridge-backed knotting technique by an Afghan rug weaver who is a member of a rug weaving cooperative in Peshawar, Pakistan. This rug is double-wefted and has 150 knots per square inch. Many skilled rug weavers can tie 40 knots a minute. The art of handknotting is still today passed down from one generation to the next with parents and grandparents teaching the younger generation on family looms at home. The skirt pictured below is part of the traditional everyday attire for Blue Hmong women who live in villages north of Chiang Mai, Thailand. 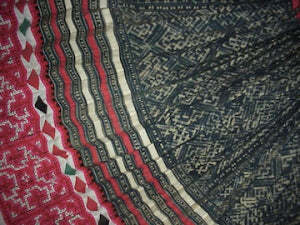 It was handcrafted by a Hmong craftswoman in Chiang Mai, Thailand. An incredible and vibrant example of wearable folk art, this elaborately accordion pleated skirt features indigo dyed block printed batik fabric, reverse applique and cross-stitch embroidery. The second image shows the intricate design and detail of all of the various textile arts that have been employed to create this magnificent piece. For further examples of fabulous folk art which truly demonstrate "the extraordinary in the ordinary" and to hear more of the stories surrounding these vibrant cultural pieces, you can check out our gallery, CADEAUX du MONDE at 26 Mary Street in Newport, RI or our website at www.cadeauxdumonde.com.